Magnificent irrigation farm 1300 ha in Robertson district in the McGregor area. 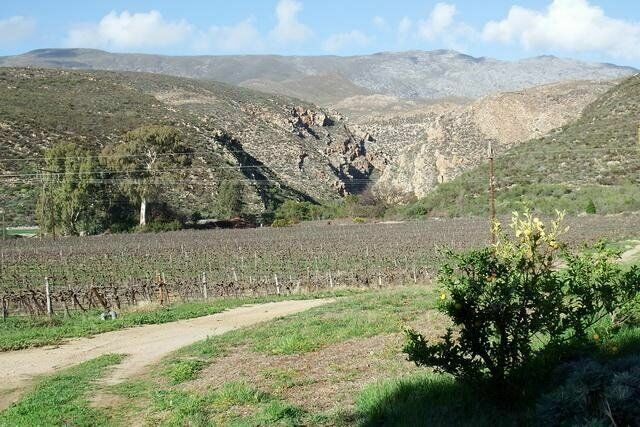 Farm has the Riviersonderend mountains as background with a big mountain catchment area of its own. The farm has 25 ha of vineyards with cultivars like Chardonnay 4,98 ha, Chenin Blanc 6,16 ha, Colombar 4 ha, Sauvignon Blanc 1,6 ha, Merlot 2,8 ha, Pinotage 2,1 ha and Petit Verdot 2,9 ha. Another 1,8 ha of Merlot will be planted this year on soil already prepared. Peaches 3 ha and 5 ha of Apricots. Vegetables like baby marrows are also planted seasonally and the rotation land is planted with cover crops like oats etc. for hay or grazing. 40 ha is presently arable and planted land. The farm has excellent potential for expansion of the arable area with another 40 ha with suitable soil conditions for crops like citrus and berries (blueberries) or more wine and fruit crops, providing sufficient water is available.